This high speed, business class laser fax with SuperG3 33.6K modem and 8MB memory stores up to 600 pages for out-of-paper reception, auto-dialing and broadcasting to 282 locations. Dual Access and Quick Scan let you scan faxes into memory while sending or receiving. A 50-page document feed, 250-sheet input capacity, 282 fax broadcast locations and 232 auto-dial numbers combine with a high monthly duty cycle and high-yield consumables to handle demanding business applications. An optional second 250-sheet paper tray is sold separately. 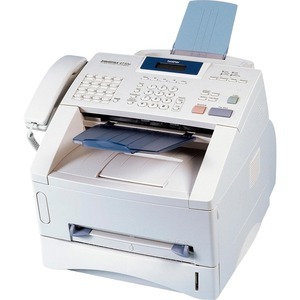 Laser fax generates 15 copies per minute, sorts, enlarges and reduces. Offers downloadable PC Fax Send Driver.